Raiders fans look toward the future after Khalil Mack trade to the Chicago Bears. Want to be a part of the R-J Raiders mailbag? Send NFL writer Gilbert Manzano your Raiders questions and hot takes. Tweet him @GManzano24 or email gmanzano@reviewjournal.com. Thank you to everyone who participated this week. Welcome to the regular season! It seemed like every risky move Raiders coach Jon Gruden made in the spring ended up in flames last weekend during cutdown day. The Raiders released wide receiver Martavis Bryant after trading a third-round pick to get him from the Pittsburgh Steelers in April. Also, Gruden finally realized that Connor Cook and EJ Manuel weren’t the best options for the No. 2 QB job and it cost the team a fifth-round pick to trade with the Buffalo Bills for AJ McCarron. Cook and Manuel are no longer with the Raiders. 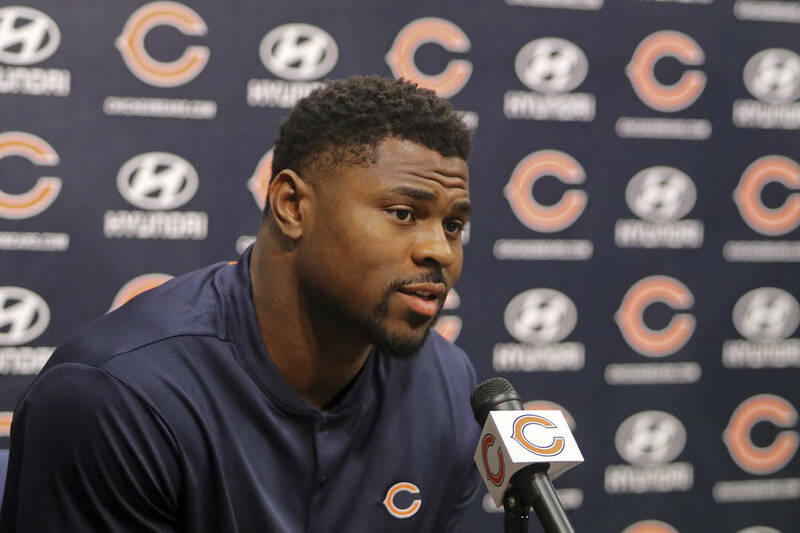 But those blunders were overshadowed by the trade that sent star pass-rusher Khalil Mack to the Chicago Bears along with a 2020 second-round pick and a conditional 2020 fifth-round pick in exchange for two first-round picks (2019-2020), a 2019 sixth-round pick and a 2020 third-round draft pick. “I think it’s reckless (expletive),” @theRealTRodgers tweeted. It’s not a surprise that many were critical of the Raiders for letting arguably their best player go. Gruden attempted to deflect some of the heat by criticizing Raiders general manager Reggie McKenzie’s draft selections from the past three years. When asked why the Raiders surrendered a second-round pick in the Mack trade, Gruden referred to McKenzie. So Gruden is OK with having final say on team moves, but prefers to have McKenzie explain the reasoning. Got it. It’s been a nightmare week for the franchise, and it’s clear the Raiders are focused on rebuilding before the team gets to Las Vegas in 2020. But with the future in mind, there are positives for the Raiders from the Mack trade. Having two first-round picks in the next two drafts gives the Raiders a chance to repair a poor defense and build around Derek Carr. With Mack, this Raiders team is probably stuck in 8-8 purgatory. I'm okay with the trade. I like Mack as a player and person, but if the overall team is better in the long run, I get it. Many Raiders fans are also seeing the future benefits. It hurts now, Raider Nation. But Gruden isn’t going anywhere. Let’s see what “Chucky” has planned for the next decade. There are many memorable moments from my rare interview with Marshawn Lynch last week at the grand opening of his Beast Mode apparel store at Town Square Las Vegas. But the one that got everyone’s attention on social media was Lynch warning fantasy owners not to draft him. Lynch didn’t sound confident that he could play another two seasons when asked if he wanted to play in Las Vegas. I reminded Lynch that he looked great on the 60-yard touchdown run that got called back in the preseason. Many assumed the Raiders running back was joking, which he probably was. Others were seriously concerned. “Is he trolling or you believe it?” @blaqmagicwarlok. “Too late, had to to draft him,” @cruzindre11. “Damn could’ve used that info before my draft last Sunday,” @TerrenceJLee1. Top 20? This must be a really good list if there are 19 better interviews than “Money” Lynch. Davis was referring to the Bryant trade with the Steelers. Gruden insists Bryant’s release was based on competition and not the potential suspension the wide receiver faces. Gruden also said the trade was worth the risk. Not sure I believe Gruden. Bryant did struggle with the playbook, but losing a third-round pick for nothing is a steep price to pay. The Raiders probably expected Bryant to receive a lengthy suspension and didn’t want to wait. Bryant is a talented wideout, but the Raiders shouldn’t have gambled on a player with a lengthy list of infractions with the league. Gruden put his legacy on the line by executing this Mack trade. Making the playoffs in the first year will quiet the critics, but the second-guessing won’t fully go away unless the Raiders miraculously win the Super Bowl or go deep into the postseason. They’ll be compared to the Bears for the next few years. If Gruden’s team is doing better than Mack’s after two seasons, then maybe the Raiders are crowned the winners of the blockbuster trade. Raider Nation might want to pray for Penn and Miller before the game Monday night. They could have a long night against Ndamukong Suh and Aaron Donald. Penn hasn’t figured out the right tackle position, and Miller will be making his regular-season debut at left tackle.